North Harbour professional Michael Hendry and Manawatu pro Tim Wilkinson have been named to represent New Zealand at the lucrative World Cup of Golf in Melbourne. The global tournament will be staged at The Royal Melbourne Golf Club from November 18 – 24. The 57th staging of the historic event will comprise of 60 players who will play four rounds of stroke play, with no cut, for US$7m and another US$1m up for grabs for the team’s event. The pair earns their place through their position on the Official World Golf Rankings on the qualification date of September 23. Hendry, who is based on the Japan Golf Tour in 2013, returns for his second appearance at the event after finishing 16th at the 2011 event in China alongside Wellington pro Gareth Paddison. Wilkinson, who advanced from the Web.com Tour this year to earn his PGA Tour card, will make his debut in the event. Duncan Simpson, the Chief Executive of the PGA of New Zealand, believed the Kiwis would be competitive at the famed Alister MacKenzie designed layout. “Mike and Tim have both played on competitive tours this year and with considerable success,” said Simpson. Simpson said that both golfers have matured markedly over the past two years. “Mike came home from the event in 2011 saying he wasn’t too far off the ball striking ability of some of the best golfers in the world and another two years on he will be even better prepared for this. 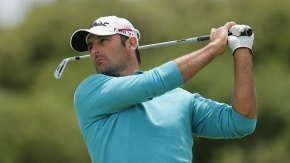 New Zealand No.1 Hendry (now 200) was a clear choice but Wilkinson earned his place by only one ranking place ahead of former US Amateur Champion Danny Lee at the time of qualification. Lee has every right to feel a bit hard done by. Following his top-10 finish at the Web.Com Tour Championship on the weekend Lee (297) is 21 places ahead of Wilkinson on the Official World Golf Rankings. Hendry has enjoyed a fine debut season on the Japan Golf Tour. He has won three titles – he defended his title at the NZ PGA Championship, won the Starwood Classic in Fiji and the ask>metro Muriwai Open on The Charles Tour. Wilkinson was the most consistent player on the Web.Com Tour with a win. He recorded 10 top-15 finishes in 2013 to finish 10th on the money-list from the regular season. A selection of some of golf’s biggest international stars including Matt Kuchar (USA), Matteo Manassero (Italy) and Thongchai Jaidee (Thailand) have already committed to the World Cup. New Zealand has a remarkable record at the World Cup of Golf. The Kiwis have played in every World Cup apart from two since it began in 1953. They have finished runner-up on two occasions - Bob Charles and Walter Godfrey in 1967 in Mexico and David Smail and Michael Campbell finished in a share of second in Japan in 2001. Auckland professional Frank Nobilo, who now works as a Golf Analyst for The Golf Channel in the States, holds the record for representing New Zealand the most at the World Cup with 14 appearances.